Drilling the borehole for a Tremorscope station. Until recently, active fault zones were thought to deform via seismic slip during earthquakes in the upper, brittle portion of the crust, and by steady, aseismic shear below. However, in the past decade, this view has been shaken by seismological observations of seismic tremor deep in the roots of active fault zones. First recognized on subduction zones in Japan and the Pacific Northwest, tremor has also been found to be very active on a short section of the San Andreas to the southeast of one of the most densely monitored fault segments in the world, near Parkfield (Nadeau and Dolenc, 2005). This deep (~20-30 km) zone of activity is located right below the nucleation zone of the great 1857 Fort Tejon earthquake. Thus, learning more about the temporally and spatially complex faulting processes in this zone may help us better understand the conditions that lead to such large ruptures. The BSL's Tremorscope project is supported by grant from the Gordon and Betty Moore Foundation. Its goal is to improve our ability to observe and thereby learn more about the tremor which occurs in the region south of Parkfield, CA, and east of Paso Robles, CA. 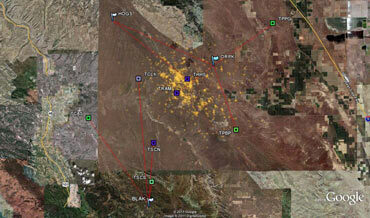 by installing eight additional high-fidelity seismic stations in the area. Installing a surface Tremorscope station. The last of the four planned surface stations was installed in June 2013, and data from them is already contributing to our tremor observations. 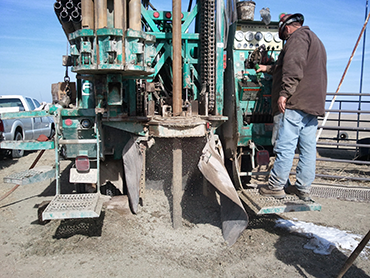 The first step in the installation of the remaining four stations has just begun with the drilling of the first borehole. The deployment of the seismic equipment in boreholes at these sites will additionally reduce ambient noise. 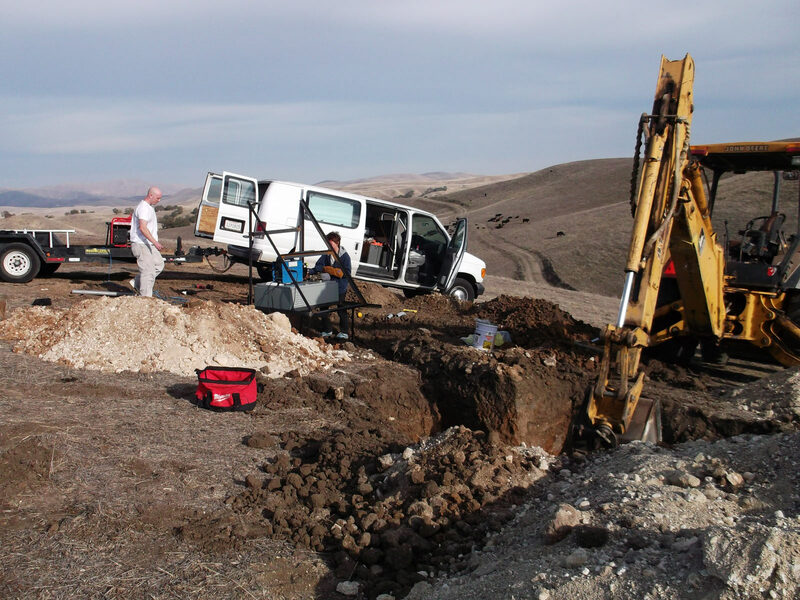 With a grant from the Moore Foundation, the BSL is installing TremorScope, four borehole and four surface stations positioned to record deep tremor along the San Andreas Fault in central California. 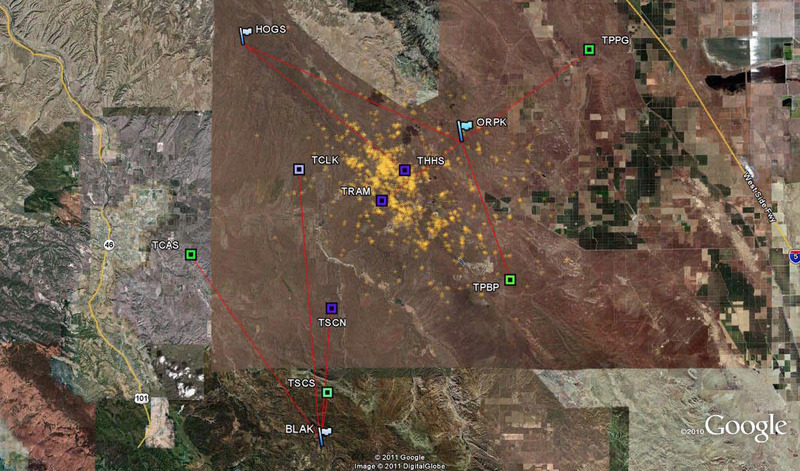 Above: recently discovered tremors (gold stars) and the location of the proposed stations, whose instrumentation will be used to study the behavior of faulting in the deep crust.